Keizer Fire District swore in a familiar name to its Board of Directors at its Tuesday, Dec. 19 meeting. 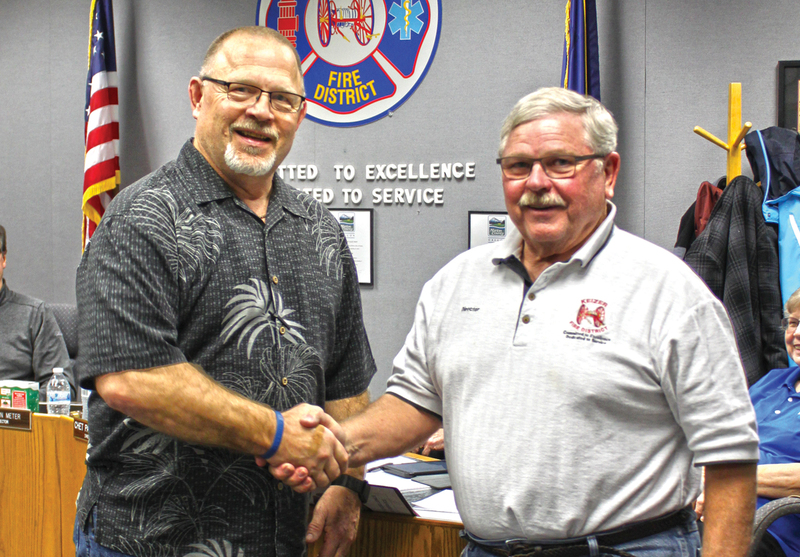 Greg Ego, who served on the board from 2001-2016, was tapped to fill the vacancy left by Mike Bauer. Ego grew up in Sweet Home. After moving to Vancouver, Wash., he worked with the Clark County Fire District for nine years as a volunteer, lieutenant and then state instructor. Ego moved to Keizer in January of 1993 to take over his father’s company, Rasmussen’s Spray Service in Salem. After a couple of years on the KFD budget committee, he was first appointed to the fire board in November of 2001. After 15 years, Ego decided to step away and let someone with new ideas join the board. But Ego said he didn’t leave with a bad taste in his month and when a position came back open, he believed he had the history and knowledge to fill the seat. The KFD Board chose Ego over John Rizzo, who has also served on the budget committee. Ego hasn’t decided if he’ll run for election in March of 2019.